Florence Mayor Matteo Renzi has been formally offered the opportunity to see if he can put together a government that can win a vote of confidence> It is not much of an issue in the Chamber of Deputies, where the PD has a majority, but in the Senate where it does not. The market, which has taken 10-year Italian yields to new 8-year lows and equities to new three year high, is vulnerable to buy the rumor sell the fact type of activity as it becomes clearer that regardless of how fast Renzi wants to run, Italian institutional arrangements will slow things to a crawl. Specifically, although Renzi apparently has been plotting for some time to take the reins of government, he does not have much of a very specific economic program. Nor do reports suggest that the youthful Renzi had made much plans for a new cabinet. Without going to the polls, Renzi will confront the same coalition as Letta and the same configuration in parliament. Alfano, the head of the center-right party and junior coalition partner, has struck a deliberative tone, wanting to negotiate a new formal agreement before casting its support for Renzi. Recall that the electoral reform package Renzi and Berlusconi agreed to would raise the threshold of parliamentary representation. This increases that risk that Alfano, and the rump of the PdL that followed him, in the break from Berlusconi, will not be represented in a new parliament, without joining forces with others. Renzi and his supporters want to blame Letta for the slow progress of the electoral reforms, but in truth the process was stalled by the submission of at least 200 amendments to the bill. Some would argue that the constant snipping at Letta's heals by center-left critics, including Renzi, weakened the already vulnerable Letta-Alfano government. It is not clear how Renzi will expedite the process. The desire for change is understandable. The economy has, for all practical purposes, been stagnant for more than a decade. Average quarterly growth over the 40 quarters through the end of 2013 was minus 0.1%. Italy is so stagnant that it did not even have a housing market boom like Spain and Ireland. It did not have a post-EMU binge on cheap credit. It has also been slower than Spain and Portugal (and Greece, for that matter) in implementing labor reforms and adopting competitive measures, no matter how reluctantly. Real exports growth has trended lower over the last three years. The most recent employment data is for Q3 13, and it was at a post-EMU high of 12.3% and youth unemployment was twice as high. Many of Renzi's supporters emphasis his youth. It may turn out to be a case of old wine in new skin. 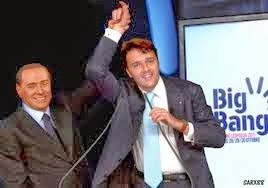 Just like Renzi found common ground with Belusconi over electoral reform, he is likely to draw support from the Old Guard and industrialists who have eaten well at the public trough. Watch the composition of the cabinet and see the political and economic interests that are represented. Watch the appointments to the state own companies and agencies and see if this is really a generational transfer of power and the passing of old ideology as some observers suggest. Italian stocks and bonds have rallied strongly on ideas that the Italian situation can only get better. If Renzi succeeds, it favorable for investors. If he fails, things are unlikely to get worse, as the cyclical recovery, no matter how modest, is under way. The positive Q4 GDP report last week and Moody's improved outlook (stable from negative) suggest there is some momentum of favorable developments. It is exactly such time, when so many observers are nearly euphoric, that the smart money may want to take some profits.